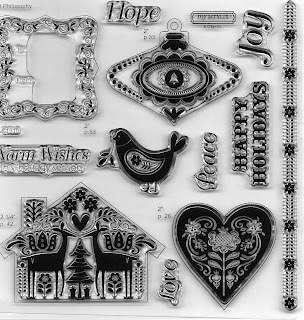 This is such a lovely stamp set with so many pretty images. I have grown very fond of using the border stamp to create my own background paper. I found this template HERE. I did things a bit differently making the card in a way that a gift card could slide in. It also gave me an opportunity to use the tag in this stamp set. You can get your Scandinavian Wishes stamp set during the month of October. It is $5 with a $50 purchase or $17.95 outright.